Mudskipper ROUS is not known for her outgoing personality, and yet, she is the life of the party, if it’s at home, anyway. When I try to imagine having a party here at the Funny Farm, with Dobby casually mingling among the guests, the potential images could cause me to accidentally choke on a canape! First, he was so grubby that he could not be allowed into the “civilized” areas of the house, so he was confined to a kitchen area directly adjacent to the back door. A literal mud room. Except that even mud would have been better than what he deposited there. I think I know why “Muddy” loved Dobby so. And even though Dobby adored his visitors, those lucky guests will recall how we had an indoor introduction time before I shooed him out the door. They followed us out once I had him settled with treats on the deck. He was territorial about his kitchen area, but he was not allowed to demonstrate that unpleasant characteristic with his visitors. Princess Mudskipper knows something is afoot because wine is being served early. Also, the couch blankets are missing. So, take a look at little Mudskipper here, so demure with the first guests. Wary but accepting. There would be more guests, for this was the 5th Anniversary of Melanie’s stroke, and a yearly celebration of her recovery. When the blankets were whisked off of the couch, Muddy, of course, jumped right up. Used to the muddy paws and feet of the Pacific Northwest, my gasp rattled the windows, but as I leaned down to observe, there was only the slightest dusting upon the upholstery. Not so much Mud, maybe more Skipper. Skippy was interested in the food and drinks, but not interested enough to knock it all onto the carpet with one deft swipe of the schnoz. Why did I even think of that? Seriously, if the cats had been out, those cupcakes would have been disastercakes. The wine glasses might have teetered off the table, and the quesadillas in the kitchen would have been well hidden “Quesadillas available by request.” Mudskipper, however, daintily strolled past, looking instead for proper capybara food. Cat treats. Nobody is supposed to know that Skippy’s favorite food is cat treats. Those do have to be kept out of reach. Most of the night, Skippy presided from her couch corner. She pretended to be interested in the conversation, took an interest in the guests, and generally behaved herself. Dobby would have obnoxiously nibbled everyone off the couch, and he would have performed horrific tricks upon the carpet. He would have nicked the electrical cords, inflicting an unwanted strobe effect on the guests. Unattended bags and jackets would earn tattoos. Tantalizing upholstery corners would have been severely disciplined. Other than the fact that Mudskipper is stark naked, she fits right in, don’t you think? Dazzling Mudskipper, Queen of all she sees, and all eyes upon her. Dobby would have cleared that room in a jiffy, and then wondered where his adoring visitors had gone. 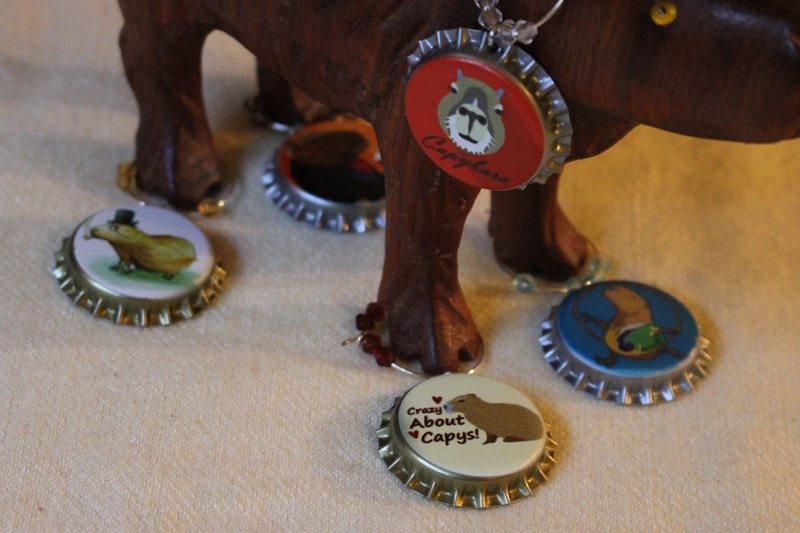 The capybara is always the magnet in any situation. We pretended it was Melanie’s party, but we all know whose party it really was. Even the most gracious hostesses bask in the eery quiet of a post-party house. Couch blankets appear from closets, sticky glasses and massacred snack trays disintegrate and vanish into the refrigerator. Bottles and cans clink as they are gathered for recycling. The Party Queen supervises cleanup. And nobody missed the cats! ← Capybaras in New Zealand?